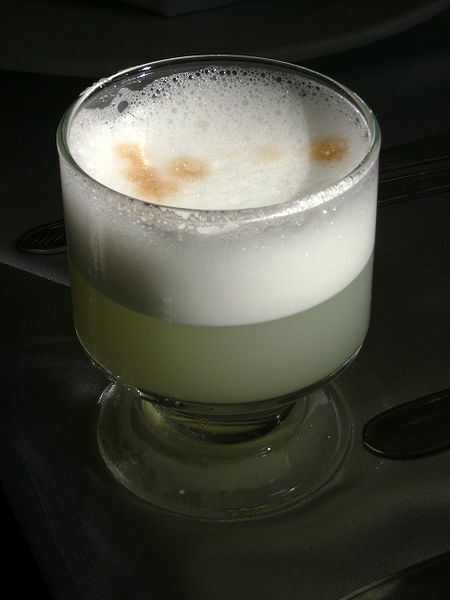 A Pisco Sour is a cocktail containing pisco, lemon or lime juice, egg whites, simple syrup, and regional bitters (like Amargo bitters, though Angostura bitters work if regional bitters are unavailable). Pisco Sour is part of Peru's national heritage, and a drink that commands tremendous pride. Peru has a National Pisco Sour Day which is celebrated on the first Saturday of February where celebrations, and festivals happen in Peru and abroad. When the Peruvian National Anthem is played all Pisco Sour's must be finished as a mark of respect. In Peru, the variety of lemon used is what North Americans would call Persian lime but Peruvians call simply "lemons". In the United States, the drink is usually made with commonly available Lisbon or Eureka lemons, which has the disadvantage of making the drink bland. Shake hard or blend with ice and strain into glass. The bitters are an aromatic garnish topping the finished drink, put on top of pisco sour foam. Serve in an old fashioned glass, straight up; without ice.